Morning all! I hope you’ve had a good week so far. Totally unpaid endorsement: I’ve been using the app Cozi to schedule appointments and share calendars with my hubby on his phone and it is working like a charm! We can share grocery lists (oh that reminds me! ), and calendars, and other lists. Bonus: he’s actually using it. haha! 😛 Anyway, I have a custom polish from Carpe Noctem Cosmetics that was made for me a really long while back that I thought I had shown you already, but I guess not! Lifetime of Love is a polish that was made based on my parents’ wedding photo. It’s a soft grey scattered holographic polish with a mix of black, white, holographic glitters and rusty red shards. I used 3 thin coats plus top coat. Formula was wonderful. Okay, gotta go – toddler is up from nap (already!). Let me know if you’ve been using any wonderful apps lately in the comments! Hello there and happy Monday to you. 🙂 I just have a couple photos of Carpe Noctem Cosmetics Empty Night to show you this afternoon. Empty Night is – to my eye – a blackened teal to blue to purple shifting shimmer polish. Formula was good, a bit thin but no flooding or running around. Hi everyone! It’s been a busy week here at my house, I hope your week is running more smoothly than mine. 🙂 For today’s post, I have a lovely polish from Carpe Noctem Cosmetics called Debogram. Debogram is a light silvery purple holographic nail polish with scattered holographic specks. Formula was smooth, if a bit thin. I’ve used 3 thin coats plus top coat. I wish the sun would have been cooperating more on the day I took photos of this beauty! 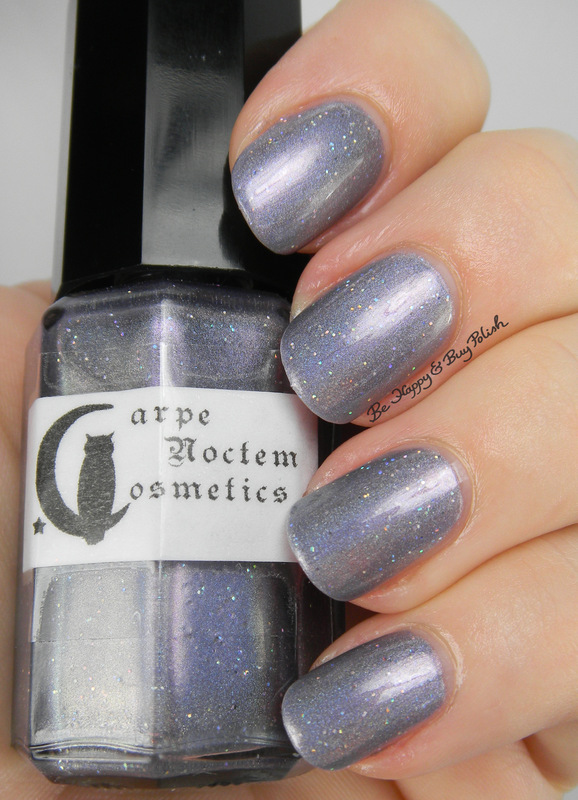 Debogram is currently in stock as of this writing at Carpe Noctem Cosmetics. Have a great day, I’ll see you tomorrow! Posted in 2015 Favorites, blog business, Indie Polish, Manicures, Nail Swatches	by Jessica W.
Hi everyone! I have a huge post today so let’s jump right in. I had such a hard time narrowing down my favorite indie polishes that I showed on the blog in 2015 but I finally got it down to 20…p.s. *phew! Good morning all! 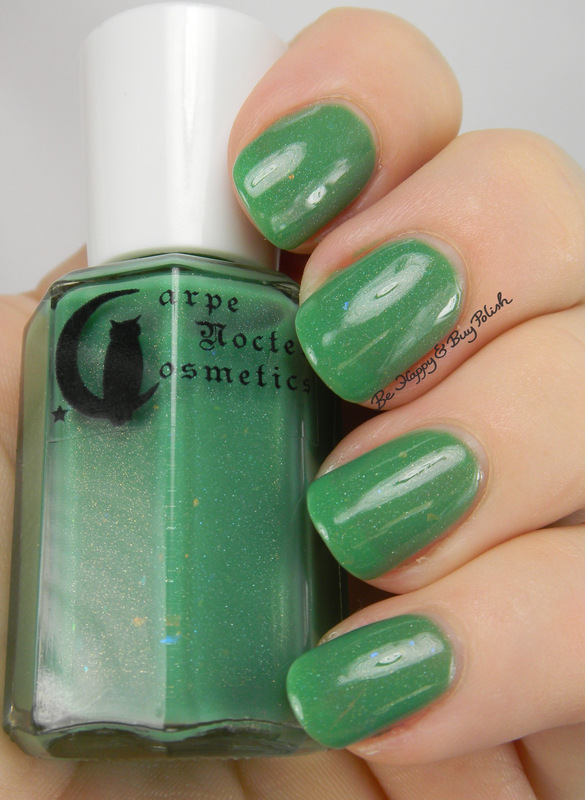 I have a really lovely polish from Carpe Noctem Cosmetics to show you today, called Drake. 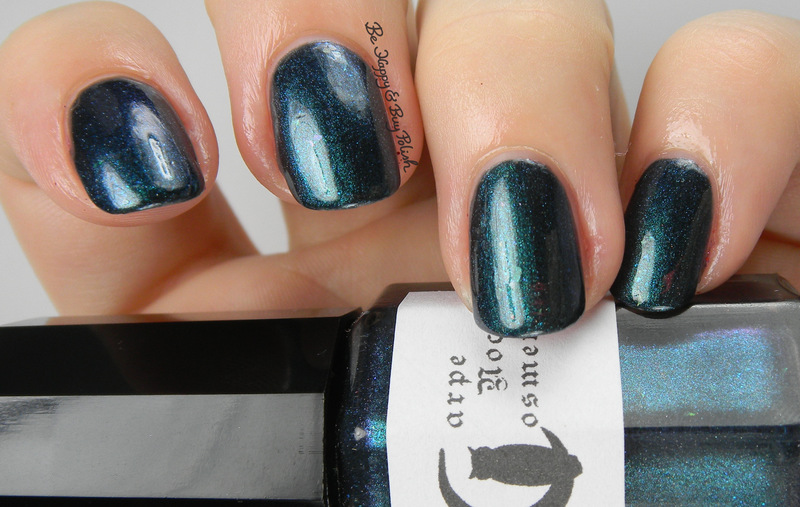 Drake is an emerald crelly texture with multi-colored flakes and scattered holo. This is 3 thin coats plus top coat. Formula was nice, not too thin and not too thick, for me. The flakes provided a really nice depth to the polish that I just really loved. 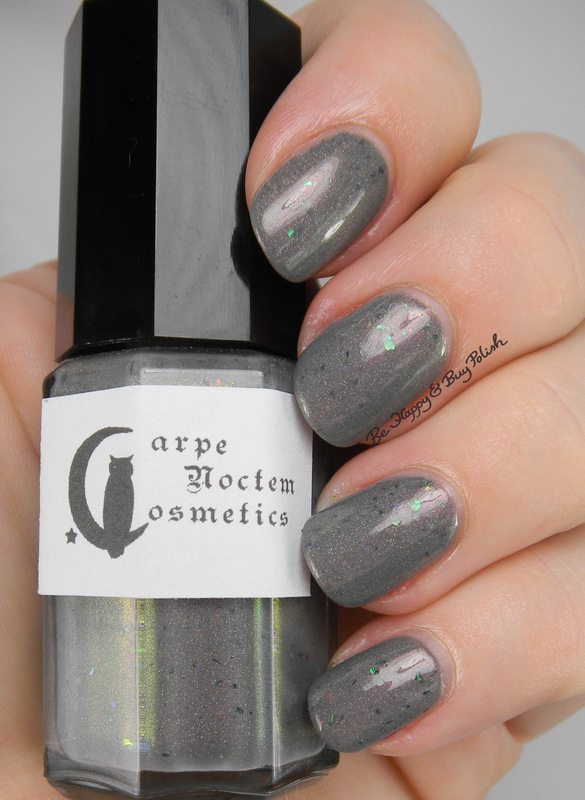 Carpe Noctem Cosmetics has a really great selection of unique polishes. The turn-around-time can be a little longer than other indie shops, just a heads up if that’s something you take into consideration when buying from an indie. Let me know what you think of this beautiful green polish! Posted in blog business, Guest Post, Indie Polish, Manicures, Nail Swatches, pictures, reviews	by Jessica W.
Good morning my stunning readers! While I’m enjoying our new addition to my family, I’ve asked a few of my fellow bloggers to guest post for me. Up first is a blogger that I have followed and admired for quite some time: Nichole from Bedlam Beauty. Her swatches are seriously amazing and she has such a great sense of humor. Today she is showing off a beautiful polish by Carpe Noctem Cosmetics: Immortal Coral. Hello hello boys and girls! I’m Nichole from Bedlam Beauty and I am taking over the world the blog for today while Miss Jessica is away. I’m super stoked to be here, and I brought one of my favorite new indie shades to share: Immortal Coral from the always-fabulous Carpe Noctem Cosmetics.